The rakes listed below can work quite well on string algae and mass types of floating algae or even submerged weeds. 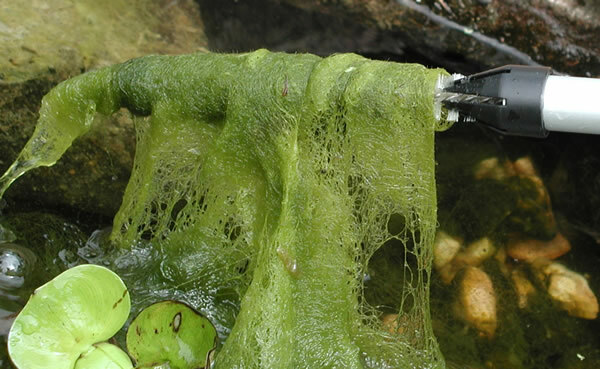 They provide an alternative to using chemicals and can be an effective way to keep a pond cleaner. Note: The Aquatic Weed Cutter is not designed for algae removal but is more suited for use as a shoreline cleaner. The Easy Pro Weed And Algae Rake is designed for larger ponds and lakes. It works great to clear string algae from around docks and shore lines. With teeth on both sides of the rake it will grab a lot of algae and some aquatic weeds. The Deluxe Weed Rake works exceptionally well on floating algae as it comes with a float attached to the head. By removing this float you can sink this rake to also remove algae and some weeds under the water as well. And finally the Aquatic Weed Cutter is great for removing rooted weeds at the bottom of the pond. Cut them low and they'll be slow to grow back.